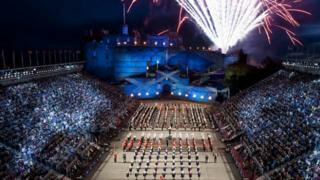 The Royal Edinburgh Military Tattoo is to donate £1m across 13 charities after another sell-out year. Organisers of the Tattoo, staged at Edinburgh Castle throughout August, said £775,000 will go to Armed Services beneficiaries. They will include the Royal Navy and Royal Marines Charity, Army in Scotland Trust, and Scottish National War Memorial. Arts organisations and youth arts groups will also benefit. The Edinburgh International Festival is to receive £20,000, while the Royal Lyceum Theatre will collect £5,000. The remaining £200,000 will go to the Tattoo's Youth Talent Development Fund and an Edinburgh City Council fund to increase access to the arts. The Tattoo has donated more than £11m to charity since the event began in 1950. This year's show - The Sky's the Limit - saw more than 1,200 international performers take part. Rucelle Soutar, head of finance for The Royal Edinburgh Military Tattoo, said: "We are beyond thrilled to mark our third consecutive £1m donations in support for military, veterans and the arts. "A strong component of this year's donation has been awarded to organisations that will continue to engage people, especially young people, with the Armed Forces; support and care for veterans as well as inspiring the next generation of musicians and dancers. "All of this will help to sustain the Tattoo and all that lies behind."